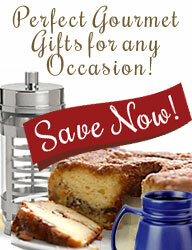 Home > Specials > Corporate Gifts > Desserts & Bakery > Gift Baskets > What's New! Inspired by flavors of the Caribbean, packed full of flavor! This golden brown sour cream coffee cake is deliciously moist and baked to perfection�the perfect gift for giving and entertaining! This coffee cake is trans-fat free and contains no artificial coloring, artificial flavoring or preservatives. Coffee cake serves approximately 10 � 12 people. Celebrate coffee and tea time with CoffeeCakes.com Pineapple Coconut Coffee Cake. Our sour cream coffeecake is a coffeecake that lifts the spirits whether for home, office or as a gourmet coffee cake gift. Can be frozen up to four months. This beautiful Double-Wall Insulated Ribbed Glass Teapot by Bonjour is a large insulated glass teapot made from borosilicate glass and has a glass infuser for brewing tea to perfection. This 31 ounce capacity teapot is perfect for brewing tea for tableside tea service. All parts of the teapot are dishwasher and microwave safe. Not for use on the stovetop. Our beautiful clear glass "Twig" tumblers are etched with perching hummingbirds are made by hand in Mexico with recycled glass. They hold 14 oz of liquid and measure 3� x 6�. Dishwasher Safe. Set of 4 glasses. Because they are hand-made AND made from recycled glass, please be aware that there will be slight imperfections in the glass and no two glasses are exactly alike. This is the nature of recycled glass and we think it makes them special. Our beautiful clear glass "Dragonfly" tumblers are etched with dragonflies and cattails are made by hand in Mexico with recycled glass. They hold 14 oz of liquid and measure 3" x 6". Dishwasher Safe. Set of 4 glasses. 16-ounce ceramic latte mug with "LIVE well LAUGH often LOVE much" in bright, colorful letters, and a floral design. Ceramic mug is dishwasher and microwave safe. What makes you happy? Going camping In a camper trailer? This ceramic coffee mug with a whimsical travel camper proclaims "Off to see the world" and has a copper token proclaiming "live happy" as an added reminder. 16-ounce Ceramic coffee mug is dishwasher and microwave safe (don�t forget to remove the token first!). A great gift for the owl and bird lovers in your life, or something for an old friend � our 12-ounce latte-sized coffee mug with a bird, an owl and "Our Hearts Are Very Very Old Friends." This 12-ounce ceramic latte mug is dishwasher and microwave safe. ceramic latte mug is dishwasher and microwave safe. Inspire someone (or yourself) with a positive message: "in a world where you can be anything...be yourself". This ceramic, double wall insulated thermal mug is adorned with a wimsical elephant and has a rubber lid to keep your coffee hot and reduce splashes when you�re on the go. 12 oz. capacity. New and unique ceramic re-usable tea bag mug designed for reuse, comfort and function. Your teabag can be nicely tucked away in the handle for simple reuse. This 12 oz mug is perfect for the tea drinker who likes to reuse teabags. New and unique ceramic re-usable tea bag mug designed for reuse, comfort and function. Your tea bag can be nicely tucked away in the handle for simple reuse.